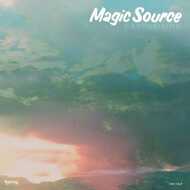 Magic Source is a project led by producer Björn Wagner (The Mighty Mocambos, Bacao Rhythm & Steel Band, Mocambo Records), who is renowned for creating an authentic and hard-hitting raw funk sound. Following a few acclaimed single releases on Favorite Recordings over the past few years, the French label deeply wanted to collaborate further with the German combo, for a special and exclusive project bringing their music on new paths. This new project is a step towards a new style: Analog-Electronica, or so called Cosmic-Disco sound. Recorded on a 16-track reel-to-reel tape, EARTHRISING combines raw unedited live band recording, with the refined production aesthetics of the Disco era, including the use of vintage synthesizers, group chants and processed acoustic percussions, for an organic club feeling. While maintaining an un-edited, but highly hypnotic four-on-the-floor groove, Magic Source leaves the old beaten track of cheesy Disco-Pop and overheard Dance classics.